Love Saves the World is very pleased to welcome Violetta Rand, who is currently on a blog tour for Blind Allegiance. 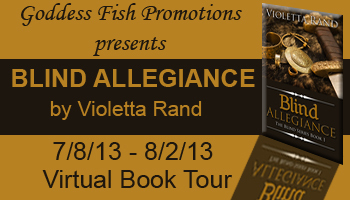 Violetta will award a $25 Amazon Gift Card to one randomly drawn commenter from the blog tour. To visit her other stops, click here. For this stop, Violetta was kind enough to answer some questions for me. LStW: Hi, Violetta! Reading through your bio, your educational and professional background in Environmental sciences is very interesting. What inspired you to be a writer? Violetta: I began my writing career before I started kindergarten. I can’t name any one thing that inspired me. Perhaps my mother was my first muse. She constantly reinforced the importance of reading/writing. And I come from a long line of artists and musicians, why not add a writer to the bunch. I was a strange child, I asked for a thesaurus and the Lord of the Rings trilogy for my ninth birthday. My favorite game growing up was playing library. I guess I could safely say writing is in my blood. 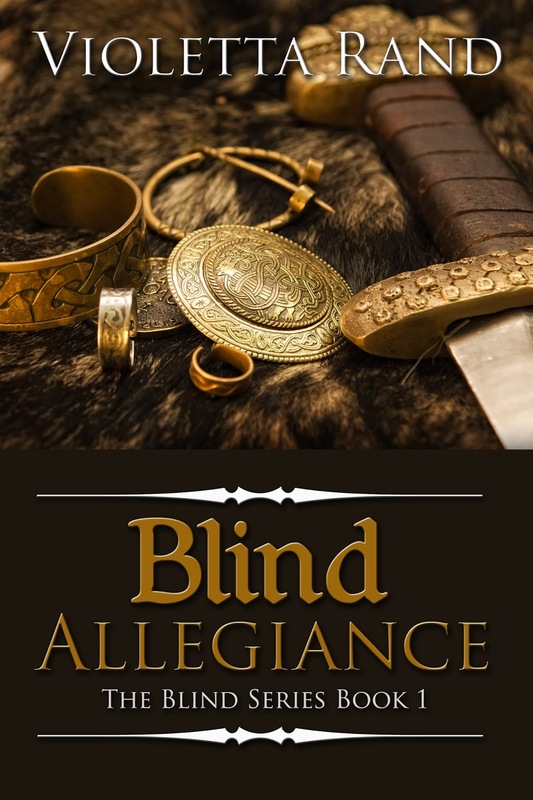 LStW: I love that Blind Allegiance is set in Norway -- an unusual location for a historical romance novel. What was the greatest challenge and best thing about writing this novel in this setting? Violetta: The greatest challenge was preserving the Viking spirit in my characters. I wanted my hero to be as close to the real thing as possible and still possess that sensitive side that all fans of romance love. The best thing is Norse culture (religion/mythology, politics, food, marriage traditions ...). There’s so much to explore and share. LStW: What books are on your bedside right now? LStW: Any current and future projects that you would like to share with our readers? Violetta: I recently signed a contract for Book 2 of the Blind Series, Blind Mercy. Book 3, Blind Vengeance, is nearly finished. I’m also working on my first contemporary romance. Thank you very much, Violetta! Congratulations on the contract and we look forward to the next books in your series! Betrayed by a brother she hardly trusted before the bloodthirsty Viking, Jarl Randvior Sigurdsson, attacks her home, Noelle Sinclair is conveniently bartered as a means to save her cowardly sibling’s skin. Forced to leave her homeland and accompany the petulant Viking to the untamed wilderness of central Norway, Noelle is ever-aware of the burgeoning dangers around her -- including her weakening resolve to resist Randvior. She covered her face, blocking Randvior’s eyes from her own. She was only guessing -- which never served anyone very well. She whirled, retreating full speed, heading directly for the cabin. She collided with a soldier. Noelle shoved him away in a huff, and tripped over her own feet as she stumbled through the door. She slammed it shut, barricading herself inside. He leaned against the doorframe, arms crossed. She couldn’t keep herself from sneaking admiring looks at his body. Only flesh and bone, she reminded herself, he’s only flesh and bone. His fine looks did little to relieve her; she was so helplessly riddled with guilt, she didn’t know what to do with herself any more. 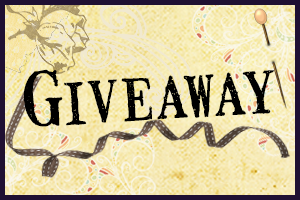 Violetta will award a $25 Amazon Gift Card to one randomly drawn commenter from the blog tour. To visit her other stops, click here. Thanks Shannon. Did you enjoy reading as a child? Thanks for stopping by Ingeborg. Thanks for hosting me today Tin. Thanks for your interview today. I was interested in your plans for 2 more books in the 'Blind' series. Will the subsequent books be about characters that appear in the first book? Book 2, Blind Mercy, focuses on Noelle and Randvior's middle son, Tyr, and Brandon McNally's eldest son Aaron. Book 3, Blind Vengeance, is a redemption story about Aaron McNally who is one of the antagonists from Book 2. Book 4 will focus on secondary characters from Blind Allegiance. Hi, Violetta! Hi, Marianne and Judy! Thank you for the opportunity! Hi, Karen, Ingeborg and Shannon! Thank you for dropping by and helping me welcome Violetta to my blog! Thanks for sharing your inspiration for writing Blind Allegiance. Congratulations on the contract for Book 2 of the Blind Series! I love your three adjectives. We don't use quixotic enough in everyday writing and conversation! It's a great word. I love the three adjectives you gave. Revealing!! Sorry I missed your post yesterday! Just checking in now to say hello! Debut Historical Romance Novels Out Now! August is Read a Romance Month!